I used H2Os for the eggs and watercolor for the basket. I then embossed a pice of white card for the back ground and the sentiment i also die cut out the digi. I used yellow glitter card for background, Then i used destress ink to age all the white. Then i added a fether and a yellow floer to finish and a few gems. and show us what you have done. 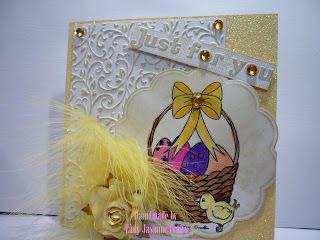 This is a beautiful card and I love the basket and the feather is gorgeous too. Beautifull card, so nicely put together and embelished. I like your embossing and the pretty feather.